Follow directions to book your appointment. The system will ask you to pick an employee. Not all technicians are listed for on line booking. Note: if you are using an IPAD it needs to be held horizontally to view all services. We offer a full range of hair care and style services for men, women, and children. Whether you just need a trim, or are looking for a brand new cut and color we would be happy to help you. See our brochure for a full list of services. 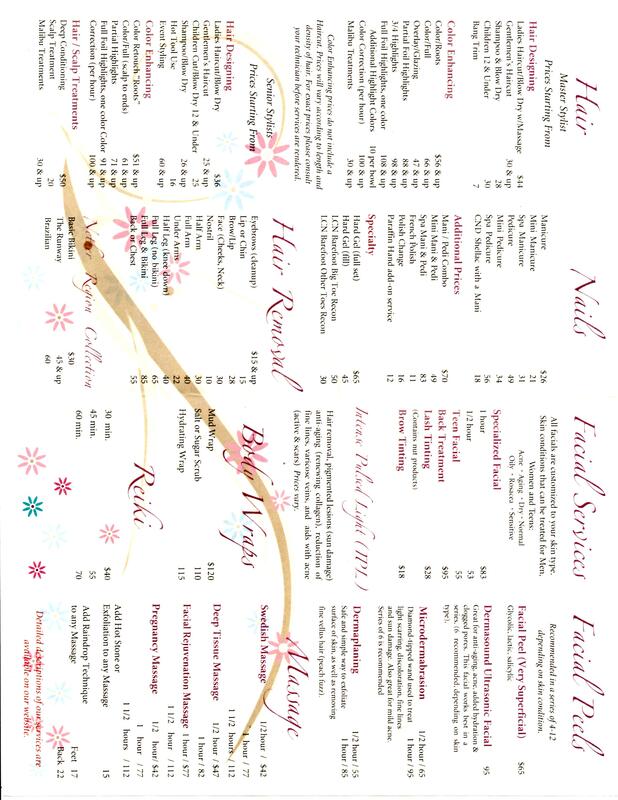 We provide manicures and pedicures to women and men. Regular manicures and pedicures come with a massage of the lower leg for pedicures or forearm massage with manicures. We offer a shorter version without the massage called a mini mani or a mini pedi. You can also treat yourself with a Spa manicure or pedicure which includes exfoliation for hands and hydrating foot mask for feet. To really treat your hands and feet, add a paraffin dip to your service. Morgan offers hard gel overlay and enhancements for strength/extra length, nail art (freehand, stamping), and LCN Barefoot Toenail Reconstruction. These treatments are more than just for pampering yourself, they can help eliminate foot or hand issues that you have encountered from an active lifestyle. When having a pedicure please be sure that your pants can be rolled up to the knee. It is also a good idea to bring flip-flops or other shoes that will not cover your toes, in order to keep your polish fresh. Please do not shave your legs the day you get a pedicure. If you have a shellac or gel polish on your nails that we put on we will need to schedule extra time for its removal so please let us know ahead of time. Unfortunately we are unable to remove shellac or gel that was put on somewhere else. Please note we are not able to get tanning cream off of nails or skin. Have you lost a toenail due to accident/injury/medical procedure? Whether the nail will grow back or it's permanently missing, it can cause feelings of self-consciousness or embarrassment. Barefoot by LCN is a one-component resin that is safe to sit even on bare skin, unlike traditional acrylic or hard gel. Please call to set up your free consultation with Morgan. Prices start at $50 per great (big) toe plus $30 antibacterial aftercare product. We offer full body waxing services for men and women. We also offer IPL (Intense Pulsed Light Therapy) which is a long term hair removal process. To reduce the appearance of fine lines and wrinkles, improve acne or most other skin conditions, and protect your skin from the environment, our facials are customized to your skin type. Better results can be accomplished if treatments are performed on a regular basis. We treat, men, women and teens. Dermaplaning is a method of exfoliation that consists of using a 10 gauge scalpel to gently scrape off the top layer of dulling dead skin cells in order to reveal a smoother, brighter complexion. Dermaplaning removes all the dead skin cells and also the facial hair, leaving the surface very smooth. Dermaplaning also allows for greater penetration of skincare products and creates a flawless canvas for makeup to glide on smoothly. Microdermabrasion sands and suctions dead skin cells, which also helps to uproot clogged pores around the nose, mouth and chin. Microdermabrasion is a minimally invasive procedure used to renew overall skin tone and texture. It can improve the appearance of sun damage, wrinkles, fine lines, age spots, acne scarring, melasma, and other skin-related concerns and conditions. A modality that can help with reduction of hyper pigmentation, acne, superficial scars, small spider veins and anti-aging. New facial clients will need to fill out some brief paper work. Please either arrive 10 minutes early or print and fill out the form below and bring it to your first appointment. A great way to release tension and stress. Treat yourself to a session today! For men and women. We also offer side by side massages and/or facials. 30 minute, 45, minute, 60 minute, 90 minute or 120 minute sessions available. New Massage Clients will need to fill out some brief paper work. Please either arrive 10 minutes early or print and fill out the form below and bring it to your first appointment. Energy Work is a great way to release stress and seek balance. If you are new to Energy Work/Reiki and would like to talk to one of our experts about its benefits, we always offer a free 30 minute consultation on how our services can benefit you. 30 minute, 45 minute, or 60 minute sessions available. 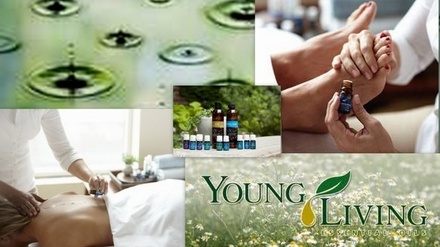 The Raindrop Massage is a method of using massage techniques, reflexology, and essential oils to bring structural and electrical alignment, aid detoxification and provide a beneficial harmony & wellness between Mind, Body & Spirit.